Although the higher reaches of the projection market belong pretty much exclusively to SXRD/LCoS and DLP technology, LCD maintains a tight grip on the mass market. But with affordable new HD Ready DLP offerings from the likes of InFocus and Optoma setting daunting standards, LCD forever seems to be playing catch-up. Perfect timing, then, for Hitachi to give the technology a shot in the arm with the successor to one of last season's finest LCD efforts. The PJ-TX300 is delightfully easy on the eye, combining a high-gloss black finish with a strikingly curvaceous and imaginative design to great effect. Connectivity is solid. While single HDMI and component jacks get the HD job done, we wouldn't have minded seeing one more of each. There's also a PC connection, a 12V trigger jack, plus S-video and composite video options for SD paupers. The HDMI input can take 1080p as well as 1080i/720p HD sources, but scales it down to its panel resolution. The projector's features list is prodigious. Key, as with all serious home cinema LCD projectors, is an automatic iris system which adjusts the light permitted through the projector lens depending on how dark or light the image content is. Thanks to this, the TX300 quotes a contrast ratio of 10000:1. Bear in mind, though that the deepest blacks will only be achieved at the expense of considerable amounts of brightness. The TX300 also sports a 'Super ED' lens array, a system comprising four ultra-low dispersion lenses together with aspherical lenses that are claimed to deliver richer, more natural colours and more accurate detailing with HD images. Elsewhere there's 10-bit video processing to hopefully improve colours and stability; motion adaptive progressive scan; various gamma and black level adjustments if you don't want to just choose the projector's automated systems; overscan adjustment; plus normal and whisper modes for the lamp (with whisper reducing the light output so the fans run more quietly). Setting the projector up is ridiculously easy. 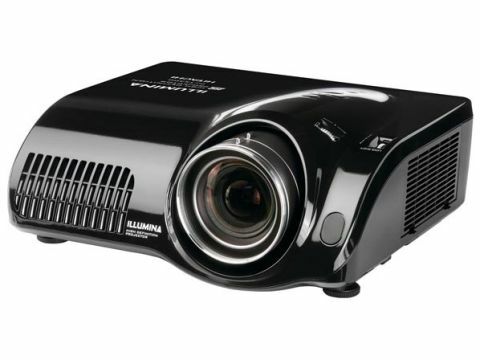 The zoom is very flexible at around x1.5, helping the projector adapt to a wide range of room sizes, and Hitachi has thoughtfully provided manual image adjustments for both the horizontal and vertical axes, as well as vertical keystone correction. The onscreen menus can be organised into 'easy' and 'advanced' lists so users can pitch them to suit their personal knowledge levels. First impressions of the TX300's pictures may seem a touch underwhelming. Its black level doesn't seem especially deep, colours sometimes look unnatural, and there are traces of the chicken wire (aka screen door) effect over bright image sectors. But careful setup pays dividends. Set the lamp to 'whisper' mode, the colour temperature to 6500K, the 'mode' to Cinema Low; and the Black option to Auto1, and the picture is transformed from the distinctly rather average into something extremely good. The black level, for instance, goes from being generally disappointing to being amongst the best we've seen from an affordable LCD projector. This is all the more remarkable since, provided you don't fall for the immediate 'pitch black' charms of the Cinema High mode and stick instead with Cinema Low, dark areas also contain plenty of subtle shadow detailing. Its colour performance is terrific, too, with the settings optimised; full of vim and vigour during bright scenes, yet extremely natural during dark ones. What's more - and this will be a key point for some projector fans - colours aren't created at the expense of any of the rainbow effect some people find so irksome with certain implementations of DLP technology. LCD can usually be relied on to deliver plenty of fine detail too, especially with high-definition sources, and so it proves here. HD images look sharp and textured, and the scaling technology is also good enough to leave many standard-def sources looking tidy. But we have some reservations. The automatic iris mechanism can cause a slightly too obvious shift in brightness levels as it adjusts to the image content, and causes a slight buzz that might be distracting for those sitting close to the projector. Really bright picture elements can also reveal very subtle traces of its pixel grid structure, and sometimes the sacrifice in brightness required to achieve the deepest black levels makes very dark scenes look a touch flat compared to its rivals. We personally still feel that top-rated DLP projectors like the InFocus IN76 can deliver marginally more cinematic pictures than the TX300. If you're one of those people who just can't see past the side effects of DLP - and I suspect that there are plenty of you out there - the TX300 can be considered good value at £1500. A worthwhile upgrade on an already proven LCD projector design.